Christopher 'Chris' Angus Ritchie was born in East Melbourne, Victoria on 16 January 1949. Chris Ritchie graduated from the RAN College at Jervis Bay in 1968. He received further training at sea and in the United Kingdom before undertaking a succession of seagoing appointments and a staff appointment at the NATO School of Maritime Operations at HMS Dryad. His commands have included HMA Ships Tarakan, Torrens and Brisbane. During his period in command of HMAS Brisbane the ship deployed to the Persian Gulf where she participated for the duration of the Persian Gulf War. In 1991, as a result of this service, he was appointed a Member in the Military Division of the Order of Australia (AM). In 1992 he attended the Royal College of Defence Studies in the United Kingdom. On completion of this course he was promoted to Commodore and had appointments in Naval Policy and Warfare, and Military Strategy and Concepts. 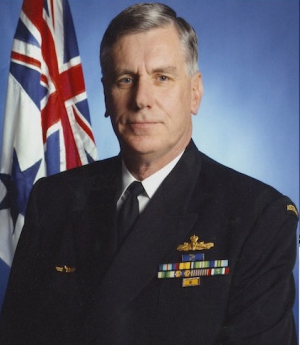 In 1997 he was promoted to Rear Admiral and appointed as Maritime Commander Australia (MCAUST). He then served as Deputy Chief of Navy (DCN) and Head of Capability Systems (HCS). As a consequence of his service in these appointments and in addition to receiving the Centenary Medal, he was promoted to Officer in the Military Division of the Order of Australia (AO) in January 2001. He was promoted to Vice Admiral and appointed Commander Australian Theatre (COMAST) on 3 August 2001. He was the first Commander to have previously served as a Component Commander to the Headquarters. He assumed command of the Royal Australian Navy on 3 July 2002 and retired in July 2005.